BioArtGal: Year of the Dog! Oh Please! Hi everyone. Now that it is Wednesday I am one day closer to my winter break. :) Too bad tomorrow night I have parent open house at school, which will make it a very long day. But after this I shall be done with those late nights until next year, and then only Friday until break. My page today is a quick page. It was my practice sketch but I thought I just wanted to have fun so I decided to use it. I sketched the cats with a Sharpie and used some watercolor crayons to color them in. I also used a little paint too. They are cartoon cats but they make me happy. My background started with spray inks, some stamping, and a couple of colors of paints. Then I added the heart and this quote. I am linking up to Art Journal Journey. Rike's got a great theme this month-Animals A-Z. We're having some very warm weather today. It is supposed to be around 70 degrees (around 21 degrees C). It's only going to last this one day, but I will take it. It means we are officially into mud season-round one. This is the parking lot at doggie day care the other day. It will probably be worse today! I love your cartoon kitties. Cats rule and dogs drool. =^,.^= I won't be complaining about the temperature today. I'll whine tomorrow when we get the sleet and snow. Upside is mud on the gravel driveway will be frozen, too. Have a great day! 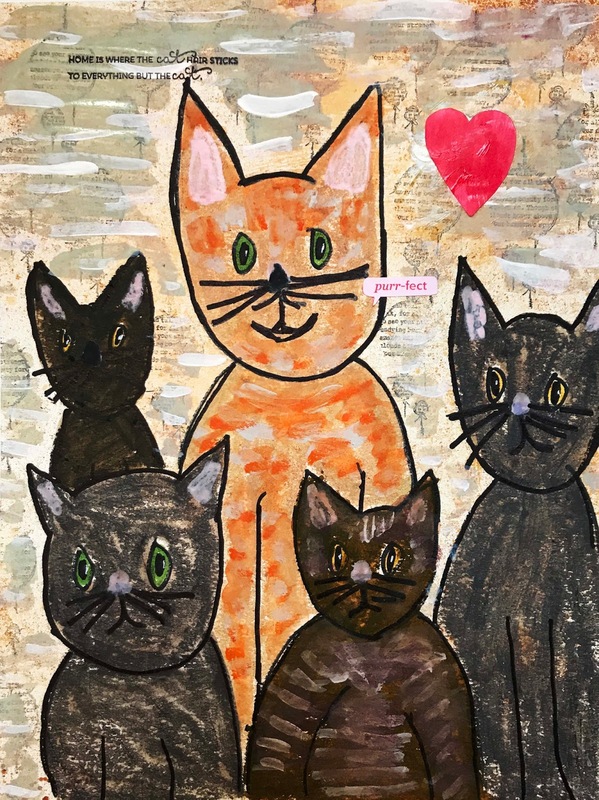 Your cat page is purr-fect for the Year of the Dog! The guy in the middle made his smile only for the photo! Then he goes on protesting :) Haha, I love your cool idea! Thanks a lot for linking your amazing journal page to AJJ today, you make me happy! Wish you patience for the rest of this week - your break is coming soon! I LOVE LOVE LOVE your protesting cat crew! The red one is for sure the king - I often heard that the red tomcats are the most special of all... I don't know - had no red cat yet. And that quote ---SUPER! Good luck for the open night --- and afterwards you have nearly the break --- SUPERB -- isn't it?! This mus weather is aweful - here the same always! You linked a fantastic page to Rike's theme again!THANK YOU my friend! Bleubeard and Squiggles are giving this two paws up. They are so tired of hearing about Year of the Dog. I really love your cat journal page. I think it is PURRfect. I like the background and I love those cats. You did a fabulous job and I am so glad you shared them with us at Art Journal Journey. I hope the rest of your week goes well and you can start your break on Friday night (grin). The cats are adorable, Erika. I used to hate parent-teacher nights when I taught - not because the parents were difficult or anything. Just that it made - as you said - a very long day. I love your fun page with the cats having a protest meeting. It really is fantastic and so are the words you added. The same could be said about dog hair in the home as well. Our car would stay muddy as well if we were going into areas like the one you shared in the photo. Hope your long day went well. Your cats page brouht a big smile to my face, good on them to stand up to those dogs. I love your cat painting Erika, and those words are so true! Good luck navigating that mud, and I hope parent's evening goes well tonight. On behalf of Lizzie and other felines, past and present, we thank you for saluting the cats who do know how to protest better than anyone! On a daily basis! I loved the page -- it was fun. And of course, I loved that there was a Marmelade Gypsy at center stage! Good luck with the mud... they're evacuating a few neighborhoods here. February? Really?